Blurb: Monolithic and majestic, the latest double album from Swans showcases some of the band’s longest and most daring musical excursions yet, producing a marvelous display of excess and grandeur. After more than three decades and numerous accolades, one might think that Michael Gira would not be left with too much in the well of creativity; yet with each subsequent release he and his cohorts in Swans release, this proves to not be the case. The band’s latest opus, To be Kind is every bit as monolithic and grand as The Seer, and while in many ways is par for the course for the group, still stands as prime evidence of Gira and co.’s audacity and inventiveness. Recorded at Sonic Ranch, the world’s largest residential recording studio, Gira and his associates seem determined to take the fullest advantage of the studio space. Never ones to shy away from long, repetitive compositions, Swans allow each track room to breathe and build, making To be Kind as much a journey of sonic discovery in which the listener is invited to lose oneself, beginning with the hypnotic opening track, “Screen Shot.” Full of distant swirls of psychedelic guitar shrieks, percussion that slowly intensifies into a cacophonous miasma of feedback and noise, the track sets the tone for what is to come, Gira’s sparse vocals galloping with the bluesy loop in a manner most arresting. No strangers to excess, the band clearly took the freedom and space to its utmost on To be Kind with some of the longest songs to be found in Swans oeuvre. “Bring the Sun / Toussaint L’Ouverture” clocks in at just over 34 minutes, beginning rather explosively as the band seems to have finally burst free from the shackles of restraint; and then, they recompose themselves and things quiet down to a pensive and tense drone. From here, the song soars through peaks and valleys of waving and waning volume and power, complete with interludes of galloping horses, whistles, and various other oddities, the song is an endurance test that this writer admits took quite a few listens to get through. Other songs are slightly more conservative in length but no less alarming. “Just a Little Boy (for Chester Burnett)” languishing in ambient wails of guitar and Gira’s barks and shouts reminiscent of Jim Morrison at his most unhinged, while the vocal chants of “She Loves Us” atop a repeating drum phrase sound almost like some tribal rite of passage before erupting into an extended post-punk rock jam. 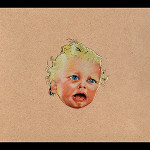 Even among the shorter tracks, Swans do well to transport the listener through alternating degrees of tension and release. Across its eight minute length, “Oxygen” maintains a nervous pace, nervous blasts of guitar and brass instruments underscoring Gira’s bellowing vocals, with only a very brief respite in the middle of the track to literally breathe. The crystalline acoustic guitar loop that drives “Some Things We Do” with swells of strings and reverberating noise makes for one of the dreamier and more quietly lush moments on the album, while “A Little God in My Hands” is a surprisingly bouncy and welcoming rock jam full of twinkling dulcimers and background vocals almost reminiscent of a gospel choir, finally climaxing in a fog of synth noise and echoed strums. With guest performers like St. Vincent, Cold Specks, and onetime Swan Bill Rieflin, there is a palpable sense of fluidity with which the band moves through every track, layering numerous disparate elements and reveling in every component almost to the point of self indulgence; building and building, breaking down, and building back up again. Like a mix of improvisational jazz, droning psychedelic rock, and meditative ritual, To be Kind is the product of a band comfortable in its established sound and method, fully embracing the freedom to play and create and allow the music to guide them. That said, for all of the album’s majesty and scale, it is not an easy ride to be taken lightly by the uninitiated. Even if you’re a fan of Pink Floyd’s “A Saucerful of Secrets,” the long version of The Doors’ “The End,” or any extended live track by any progressive rock band, To be Kind will require a great deal of patience and desire, and its simultaneous abruptness and suspense will surely be jarring for even the most attentive listener… but the rewards the album yields will make it all worth it in the end.